Our 2019 Summer/Fall catalog is full, with abundant offerings to be experienced within these spirit-filled red hills and blue skies. 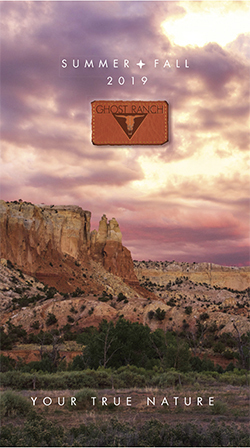 Give yourself or someone you love the gift of Ghost Ranch, time away dedicated to renewal. Explore your passion or a take part in a new adventure that fills the creative you. We hope that you will find an offering that speaks to you and that will refresh in a way that only freedom of time and open space can. Register early to secure your spot and to help us prepare for your arrival.